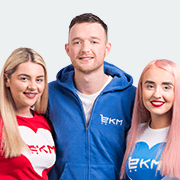 “Our mission at EKM has always been to help businesses just like yours succeed and we want to ensure that EKM is the perfect solution for your business. That's why we’re offering a six month money back guarantee on all new paid monthly EKM shops (on the Standard and above monthly plans) if you cancel your account and feel the service that we provide falls short of your expectations within the first 6 months of signing up. The only conditions we have are that you work with your Account Manager to make your shop the best it can be and you cancel within the first 6 months. It's as simple as that. •Our 6 Month Money Back Guarantee is service based and therefore requires you to be on the EKM Standard, Advanced or Pro plan and does not cover plans billed annually. Get started now with your very own Account Manager, or speak to us for more information.